UPDATE: SQL Operations Studio is now GA and renamed to Azure Data Studio. For the most up to date information please visit our monthly Azure Data Studio blog post and download and install the latest release here. We are excited to announce the April release of SQL Operations Studio is now available. 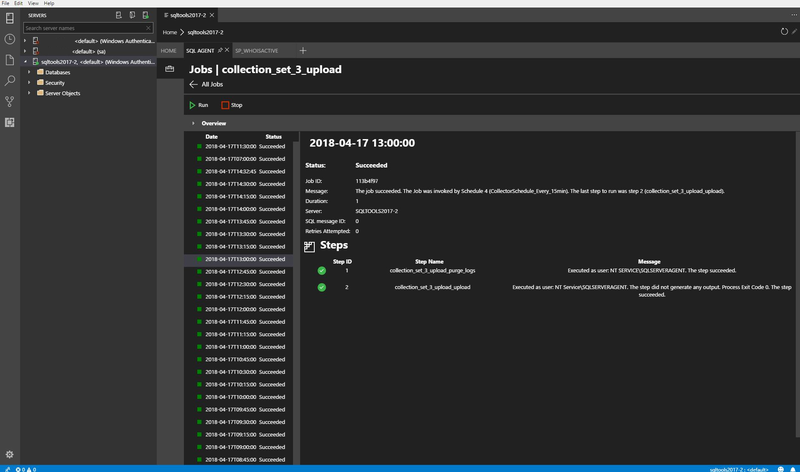 Download SQL Operations Studio and review the Release Notes to get started. SQL Operations Studio is a data management tool that enables you to work with SQL Server, Azure SQL DB and SQL DW from Windows, macOS and Linux. To learn more, visit our GitHub. 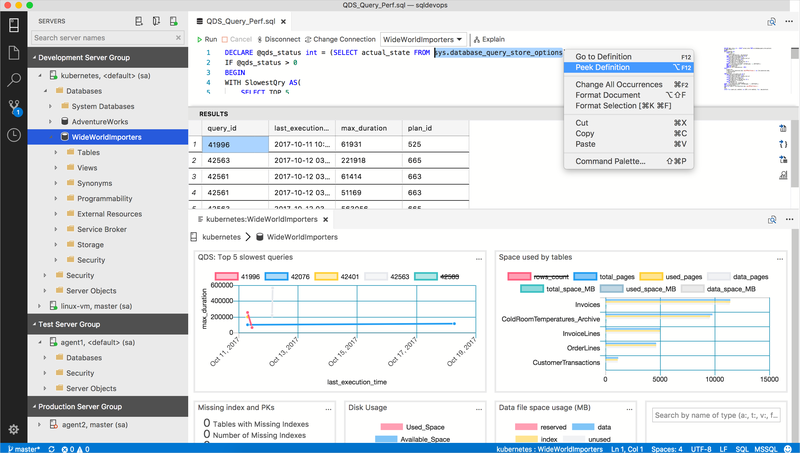 SQL Operations Studio was announced for Public Preview on November 15th at Connect(), and this April release is the fifth major update since the announcement. If you missed the March release announcement can be viewed here. The April Public Preview release is focused on improving our Extensibility experience with the release of new extensions as well as addressing top Github issues. Highlights for this build include the following. For complete updates, refer to the Release Notes. Since SQL Operations Studio was released for public preview, one of the most requested features was providing SQL Agent support. Bringing over the most popular SSMS features has always been on our roadmap, but we wanted to make sure we did this the right way. For years, customers have submitted issues that were difficult to change due to being built on old dialog and wizard frameworks. With SQL Operations Studio, we had an opportunity to bring a modern user experience to our features while maintaining the same functionality that our users are experts with. To make this possible, the engineering team reached out to the SQL Server community to learn more about your top scenarios and get direct feedback about our initial mock-ups. This involved creating surveys, scheduling user interviews, and promoting community discussion through a demo on Youtube showing our initial prototype. With your help and the release of Extensions Manager in the March release, we have provided you an initial preview release of SQL Agent. When you install SQL Agent from the Extension Manager, you can view the SQL Agents extension as a tab on your server dashboard. To learn how to install an extension, please view this how-to guide. 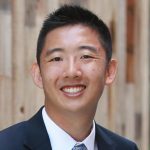 This initial release focuses on providing a great View Jobs and Job History experience. 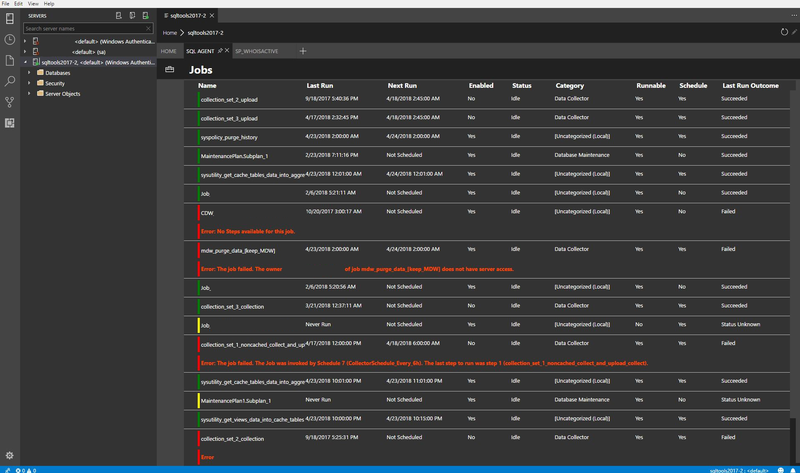 You can see a list of all jobs including color-coded successful and filed jobs, names of jobs, and error messages. To see the job history of a specific job, you simply click on that job. This view lets you see a history of past runs, and also provides the ability run or stop the job. The next step will be to add Job Configuration functionalities, including providing support for creating a job, setting alerts, and scheduling jobs. We would love to hear your feedback about this initial release through our GitHub Issues page and also any suggestions you may have as we build out Job Configuration. This is the first step as we continue to bring over popular features to SQL Operations Studio from SSMS. Please continue to let us know what are your must-have features and feel free to join the discussion. In the March Public Preview release, we first introduced the Extension Manager to SQL Operations Studio. With this release, we introduce 5 new extensions that you can now try out in the Extensions Manager (to get started, read the how-to install extension guide). SQL Agent is the extension to view and run SQL Agent jobs as described earlier. SSMS Keymap ports the most popular SSMS keyboard shortcuts to SQL Operations Studio. Created by Kevin Cunnane. AlwaysOn Insights is a collection of widgets designed to provide insights into AlwaysOn Availability Group components to assist DBA’s or similar in managing their environment. Created by Matt Lavery. 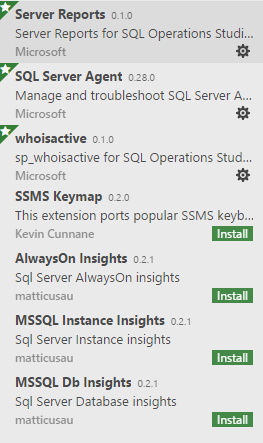 MSSQL Instance Insights is a collection of widgets designed to provide insights into MSSQL Instance to further extend the built-in default widgets. Created by Matt Lavery. MSSQL Db Insights is a collection of widgets that are designed to provide insights into MSSQL Database to further extend the built-in default widgets. Created by Matt Lavery. For additional resources to get started writing an extension, please refer to our GitHub Extensibility Wiki Guide. Feel free to also reach out to @sqlopsstudio on Twitter if you need help getting started after checking out these resources. As we build out our extensibility story, we will continue to collaborate with the community to learn and improve the way we build and publish extensions. This is the way we envision bringing over SSMS features while also empowering the community to contribute and build their own extensions to share with the community. #37 When the chart viewer throws an error, unexpected behavior occurs. If you have any feature requests or issues, please submit to our GitHub issues page. For any questions, feel free to comment below, message us on Gitter, or tweet us @SQLOpsStudio.